Listed below are some standout stalls and you should try them each in turn ( but never one after another !) to appreciate their unique flavours. Then choose your own favourites to introduce to your Grandmas/BF/GFs. Classic colours. Drop dead looks. Chicken meat chunks, pork skins. Restaurant USJ 2,, USJ Subang. Nyonya style. With mint leaves. Unique fragrant taste only the Nyonyas know how. Chicken meat chunks(but cold), ...& still no cockles ! Kwai Sun SS 15 Subang Jaya. Morning Market SS 2 PJ. Nearer Hong Leong Bank. Overcrowded and chaotic place in da most pampered eating zone of Klang Valley no less ! Cheap cheap at RM3.00 only. ( but don't forget to compare size of bowl tho on yr next stop ). Exemplifies 'follow da crowd' behavior to the hilt. Cockles & fish balls now introduced ! Chicken meats. Easy going cool place. Surprisingly fresh. Introducing fried wantans. Penang curry Mee. Clear gravy until you throw in the turbo version. Introducing slippery cuttlefish strands. and chicken meat slices ( look no bones !). deshelled prawns and chicken flossed meats + divine cockles. ....never mind, all RM9.00 of it ! oh my gooodnessss, i have not lived!!!! some of the ones look soooooo orgasmic, cockle or not. but frankly, somehow without cockle, hmmmm, cant be as good i feel. the only one i've tried is la manila. like fatboybakes, I feel as though I'm missing out as the only one I have tasted is Hong Seng's curry noodles which is really good I must admit. I love the cockles too. Not a fan of cockles. 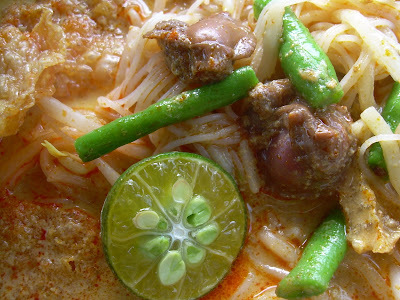 When it comes to curry noodles fave spots, it will be in KL! One is the stall along Tengkat Tong Shin. On the same row as Meng Kee Char Siew, go pass Adik Beradik Chua and pass the trendy "old" restaurants. You will see it located at a cornershop. They sell economy rice and noodles. Why I love the curry here? They have the deep fried crispy intestines! The other one will be at the other corner on the same row (so that will be before Meng Kee, at Chin Hai restaurant). The Sar Hor Fun stall serves a different but tasty curry noodles. Will do a post one day! wow.. this make me drool. 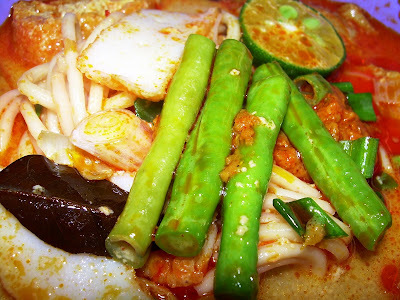 I like curry laksa but never try any that you've mentioned. I don't really eat the cockles, but a little bit of the cockles blood does boost the curry laksa taste! I like your blog. I tagged you. Maybe I've bumped into you while tucking in a bowl of noodles @ the SS2 Market? There's a pretty good stall at the wai sek kai in section 14. Enter the basement level through entrance located between Metrojaya and KFC. 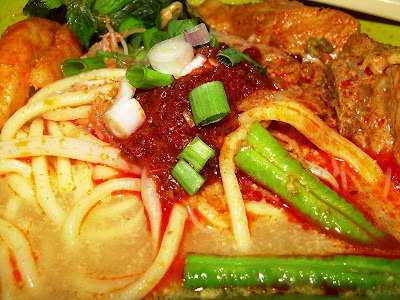 It also sells Assam Laksa. But the best curry mee eva can be found in Ipoh! Hmm..Food post Idea. Hahahah. Scared my Family members O/D from Curry Mee only. oh no! oh no! this can't be curry mee! one important 'bestest' ingredient is missing - pig's blood!! (coagulated pig's blood cut into cubes). curry mee is not curry mee without pig's blood! 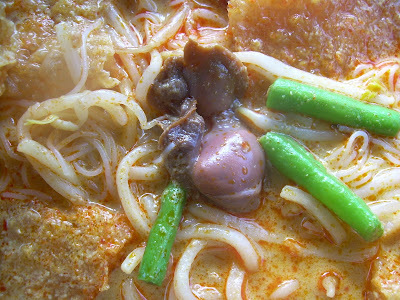 kl curry mee no pig's blood one kah? 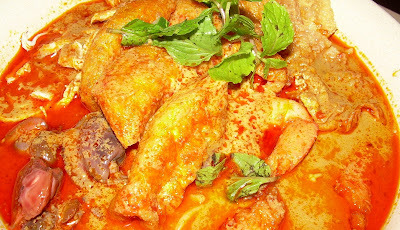 penang curry mee sure have pig's blood.... that and cockles, to me are the two most important ingredients in a curry mee (of course not to mention the obvious lots of sambal). 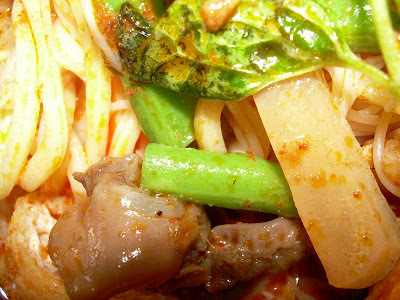 Aiya, the curry mee is not supposed to have green beans one...and yes, like Lucia said, where are the pig blood cubes? I think I have to go back sooner to help these hawkers getting things straight. But if they don't sell it as Penang Curry Mee, then it's forgiveable. LOL!!!! U r right go try kwik ! Cockles r de 'c' spot so do not miss them ! sure, when I fly there or I fly u in ! OK when ? Dun miss the La Manila one ok...then see the Guardian ! Yes ! We would all love to see that pouting look ! Quick ! I ( & us) shall look forward to your post then TQ. TQ 4 comin in $ the link also. I m sure we can discover more places ( esp Klang) together ! Thought u r in BKK ? Well probably yes, u mean da one with da pretty girls one ah ? Ipoh curry mee in old town (near the chee cheong fun place) with the prawns and chickens are great too ! Sorry my sweet lady I was thinking of that. I remembered RM's recipe which included the blood(OMG)but I think u can hardly find them here in KL/PJ ! Ok now I go look for it ! gosh. i sorethroat ler.. ate assam fish head.. then tomyam soup the next day.. and then another hot curry laksa.. lagi now saw ur post..
tks 4 dropping by. hahaha never mind enjoy now suffer later! Thanks 4 the information. Will check it out soon, as soon as I recover from the lovely sore throat! thank yu anon for yur tip/comments ! we shall keep a lookout for this place . cheers !